The short documentary below explains PLO/Fatah’s history. We did not place country restrictions on the video. That leaves us with the second possibility. But what local laws can You Tube be complying with? To my knowledge, no laws have yet been passed by the Israeli Knesset against the dissemination of historical facts. 1) PLO/Fatah—created by a leader of the Final Solution—was brought inside the Jewish state—created (supposedly) to protect the Jewish people from Final Solutions—because the Israeli government signed the 1993-94 Oslo Accord. 2) But why? In 1982 Menachem Begin had already (essentially) destroyed PLO/Fatah and chased the remnant out of Lebanon to its new base in Tunis. So in 1993-94 the Israeli government was breathing new life into a defeated, moribund PLO/Fatah. 3) In doing so the Israeli government gifted PLO/Fatah with its most important victory: legitimacy on the world stage, and lordship over the Arab Muslims in the strategic ‘disputed territories’ of Judea and Samaria. 5) With PLO/Fatah’s entry, terrorism against Israelis immediately quintupled, and the security situation worsened for the long term because PLO/Fatah has been indoctrinating the Arab Muslims in the disputed territories into its ecstatic genocidal ideology (not precisely a secret). 6) The Israeli government is still trying to sell the Israeli people—and Jews worldwide—on the idea that a sensible solution to Israel’s security woes is to give the strategic high ground of Judea and Samaria (a.k.a. the ‘West Bank’) to PLO/Fatah. 7) There is a real possibility that the Israeli government will make this strategic territory judenrein (this is a German Nazi term meaning ‘cleansed of Jews’) for PLO/Fatah. They already did it in Gaza. 8) During the long years since the so-called Oslo ‘Peace’ Process began, the Israeli government still hasn’t informed the Israelis about PLO/Fatah’s origins in the German Nazi Final Solution. 9) This Oslo ‘Peace’ Process could have been quickly killed in its tracks if, when the US government first began bullying for it, the prime minister of Israel had simply called an international press conference to explain the origins of PLO/Fatah in the German Nazi Final Solution. 10) At any point since 1993-94, by holding such a press conference, the Israeli government could have scored a major propaganda victory in favor of Israeli Jews, and in favor of ejecting PLO/Fatah from Israel. But no such press conference has yet been called. On the basis of the above 10 points one may conclude that, if the information in this video becomes widely known, those running the Israeli government will have some egg on their faces. In fact, this information raises the sharpest questions about them, and about their intentions. Here then is a plausible motive for the Israeli government to block the video: to stop Israelis from asking such questions. But in fact questions must be asked not merely about the Israeli government (in the narrow bureaucratic sense) but also about the Israeli ruling elite more broadly. 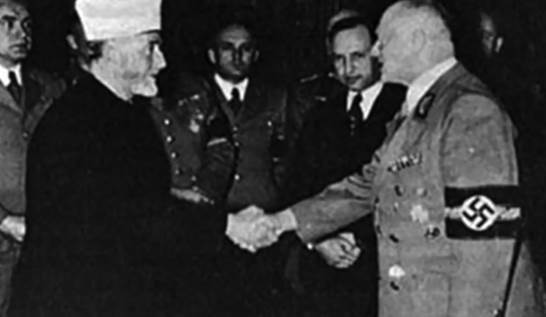 For none of the major politicians who declare themselves opponents of the Oslo ‘Peace’ Process and its ‘Two State Solution’ have educated Israelis about the German Nazi Roots of PLO/Fatah. Why? The video follows below. And below the video is a discussion about the evidence it presents, and how this evidence has been either ignored or lied about for many years. 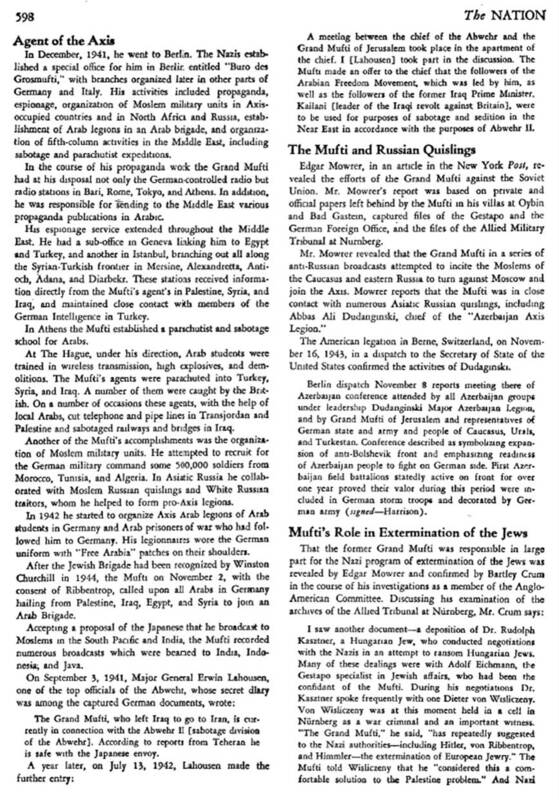 Immediately after the war, Husseini’s Nazi activities were well understood, as the article from The Nation (1947) which I have posted to the right of this column attests. But then a tremendous silence about Husseini and his Nazi years developed. Certainly the media, which displays always the latest news on the Arab-Israeli conflict in its front pages, has had nothing to say about the Nazi origins of PLO/Fatah ever since PLO/Fatah was created in the 1960s. The silence in academia has been equally deafening. Pearlman, M. (1947). 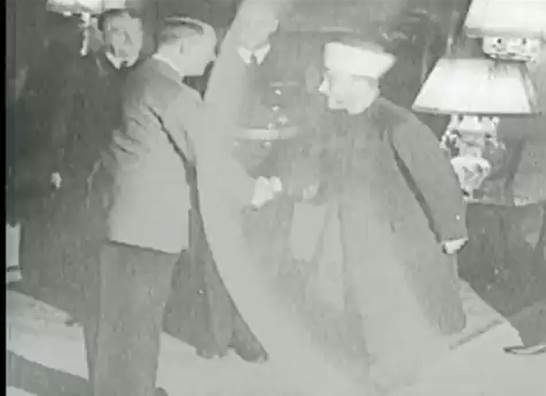 Mufti of Jerusalem: The story of Haj Amin el Husseini. London: V Gollancz. Joseph B. Schechtman, The Mufti and the Fuehrer, New York, 1965. 4) that Husseini recruited thousands of Bosnian and Kosovo Muslims to Heinrich Himmler’s SS, who went on to kill hundreds of thousands of Serbs, and tens of thousands of Jews and Roma (‘Gypsies’). It is beyond dispute that Husseini did all that. 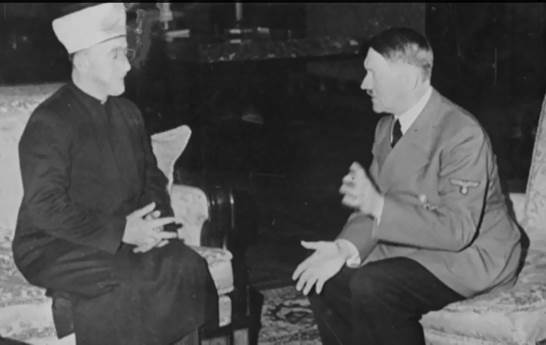 And in fact photographic evidence of Husseini’s Nazi collaboration abounds on the internet. But there has been quite an effort to whitewash Husseini’s responsibility in the German Nazi death camp system specifically—in other words, his responsibility in the Holocaust, or as the Jews more properly say, in the Shoah (‘Catastrophe’). One example of this whitewashing effort is Wikipedia’s page on Husseini. Because of its emblematic nature, I shall now quote from the Wikipedia article on Hajj Amin al Husseini as I found it on 14 July, 2013 and then comment. Al-Husseini settled in Berlin in late 1941 and resided there for most of the war. Various sources have repeated allegations, mostly ungrounded in documentary evidence, that he visited the death camps of Auschwitz, Majdanek, Treblinka and Mauthausen. 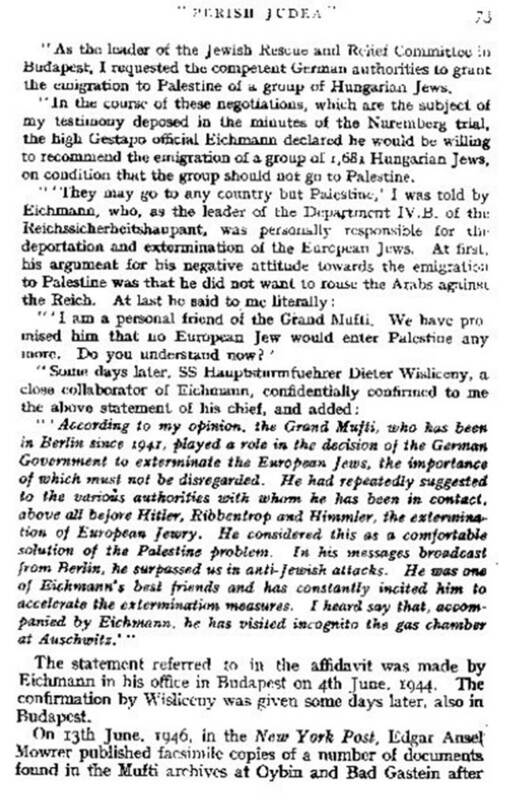 At the Nuremberg trials, one of Adolf Eichmann's deputies, Dieter Wisliceny, stated that al-Husseini had actively encouraged the extermination of European Jews, and that he had had an elaborate meeting with Eichmann at his office, during which Eichmann gave him an intensive look at the current state of the “Solution of the Jewish Question in Europe” by the Third Reich. Most of these allegations are completely unfounded. Consider first the phrase “completely unfounded” as it attaches to any part of Wisliceny’s Nuremberg testimony. As part of the legal proceedings at the Nuremberg War Crimes Tribunal, two independent witnesses (Andrej or Endre Steiner and Rudolf Kasztner)—both of whom had had personal contact with Dieter Wisliceny during the war—reported to the Tribunal that in wartime conversations with Wisliceny he had said certain things about Husseini’s role in the Final Solution (the genocidal enterprise in which Wisliceny was not just anybody but a highly-placed administrator). The Steiner and Kasztner testimonies are quite similar to each other. Before his execution for crimes against humanity, Nuremberg Tribunal investigators called on Wisliceny to either confirm or deny what these two independent witnesses had said. 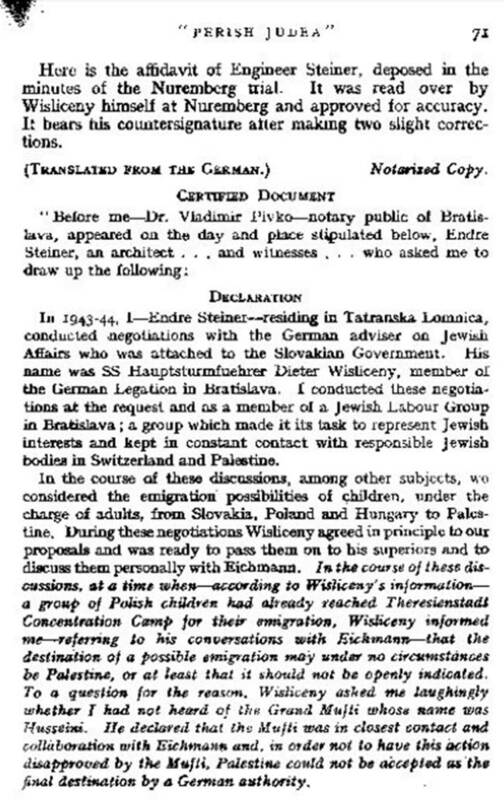 Wisliceny did correct them on minor points but he confirmed what they had both stated concerning Husseini’s central and originating role in the extermination program (consult footnote  to read the Steiner and Kasztner testimonies). 2) that Wisliceny is less credible as a witness than witnesses who contradicted his statements. So I ask: On the basis of what evidence do the Wikipedia editors argue that “most of these allegations are completely unfounded”? Gerhard Höpp (2004). “In the Shadow of the Moon.” In Wolfgang G. Schwanitz. Germany and the Middle East 1871–1945. Markus Wiener, Princeton. pp. 217–221. The title is incomplete. 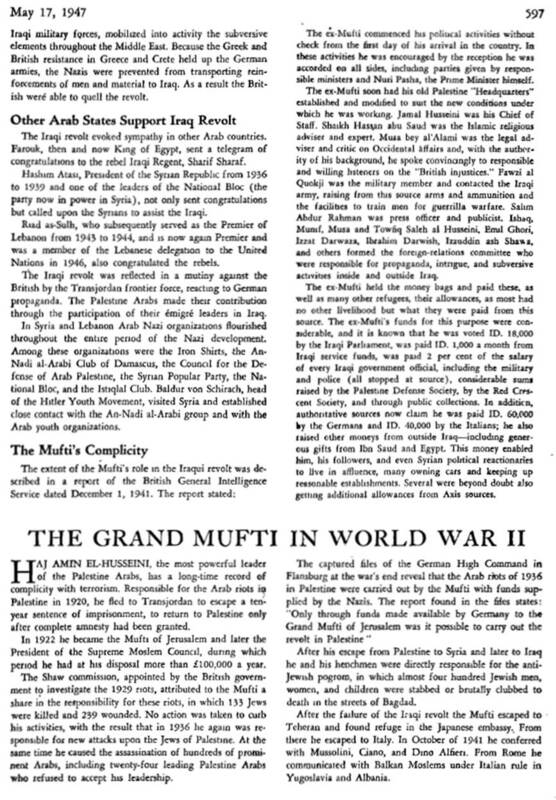 Gerhard Höpp’s article is: “In the Shadow of the Moon: Arab Inmates in Nazi Concentration Camps.” The full title makes it obvious that this article is not about Husseini, something that readers who see only the truncated title in the Wikipedia reference will not realize. 3) that Husseini met with Eichmann to discuss said extermination. But notice that Höpp says absolutely nothing about allegations 2 and 3. In other words, since we already know that Husseini was a rabid anti-Semite who himself organized mass killings of Jews before he met the Nazis, and then also with the Nazis, and discussed with Hitler the extermination of the Middle Eastern Jews, and shouted on the Nazi radio “Kill the Jews wherever you find them,” is it not a waste of time to argue back and forth whether Husseini did or did not visit this or that death camp with Eichmann? Didn’t the judges also attend? Anyway, let’s look at Arendt more closely. To her, two independent testimonies at Nuremberg concerning Husseini’s relationship with Eichmann, later corroborated by Wisliceny, a highly-placed eyewitness, are “rumours.” This is strange. And, against this, Arendt simply accepts Eichmann’s denial. Doubly strange. Why has Eichmann earned so much respect from Hannah Arendt? 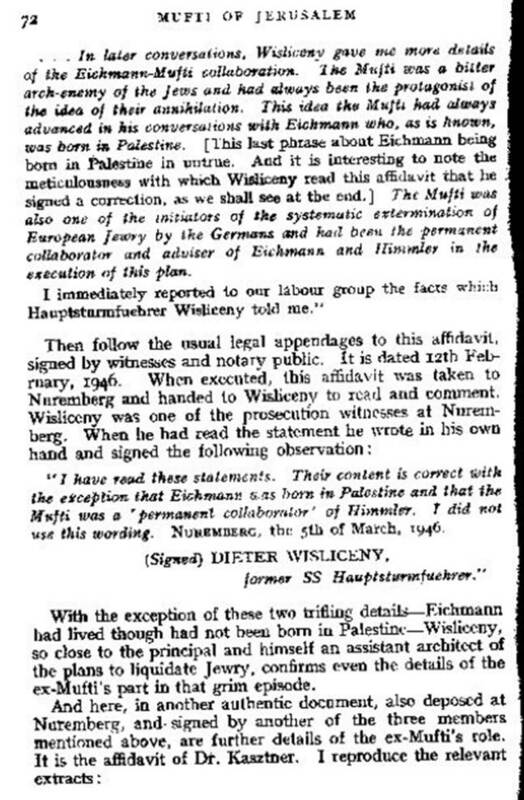 But more to the point: Do we have reasons to consider Eichmann a more credible witness than Wisliceny? Arendt shouldn’t think so. She wrote Eichmann in Jerusalem: A Report on the Banality of Evil so that she could extend herself in deep ruminations about the human soul based on (odd choice) Eichmann’s strange behavior at trial, which led her to call him a “clown.” Wisliceny, by contrast, was universally considered by prosecutors as a very careful witness, who was painstaking in correcting the smallest details in the testimony he was asked to comment on. Medoff’s argument turns on a semantic point. If we agree with him that the mass killings of Jews on the Nazi Eastern front, which began before Husseini arrived in Berlin, are part of the ‘Final Solution,’ then Husseini is not “one of the originators” of the ‘Final Solution.’ But the question here is not one’s definition of what the term ‘Final Solution’ should cover. The question is whether the Nazis had yet decided, before Husseini alighted in Berlin, to create a death camp system to kill all of the European Jews. They had not. 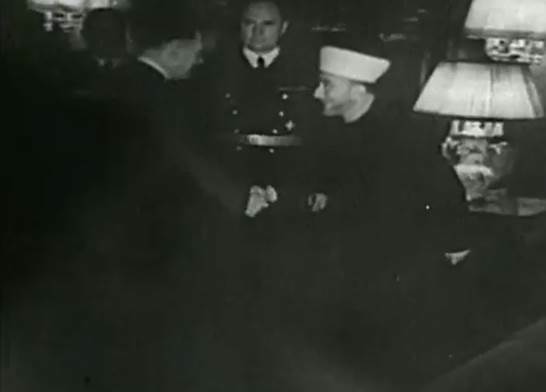 And that decision was formalized at Wannsee, indeed shortly after Husseini arrived in Berlin. 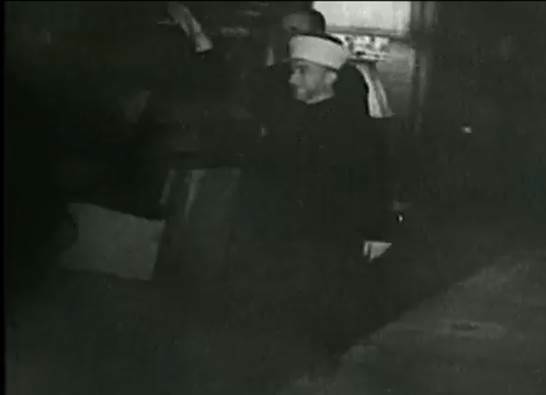 Hajj Amin al Husseini arrived in Berlin in “the autumn of 1941”—to be precise, on 9 November 1941. So yes, there had already been mass killings of Jews on the Eastern front, but for the hypothesis that Husseini had something to do with the Nazi decision to set up the death camp system in order to kill every last living European Jew (instead of sending most to ‘Palestine’), Husseini arrived right on time. Medoff disparages the evidence we have as “hearsay.” Is it? In US law there is a famous “hearsay rule,” which says that if an eyewitness cannot present his or her testimony in court, then another’s report of the supposed testimony is inadmissible. [11a] Medoff is turning this legal tradition into a historiographical principle in order to do away with the evidence from Wisliceny. Is this a proper maneuver? A historian is not subject to the caution of a court of law, which must err on the side of presumption of innocence in order to safeguard a person’s rights. But even if a historian were so constrained Medoff’s reasoning does not apply. We have two independent testimonies before the Nuremberg Tribunal, by Andrej (Endre) Steiner and Rudolf Kasztner, about their wartime conversations with Wisliceny, the topic of which was Husseini’s key role in 1) the decision to exterminate all of the European Jews and, 2) the administration of the death-camp system with Adolf Eichmann. These two testimonies, by themselves, count as ‘hearsay.’ But are they inadmissible? Actually the hearsay rule has exceptions that a judge may invoke, and having two consistent and independent testimonies could favor such an exception. But this is not even necessary. Both testimonies were corroborated by Wisliceny, whose “direct experience” of the relationship between Husseini and Eichmann is well established, since Wisliceny was Eichmann’s right-hand man. Wisliceny is an eyewitness. This is not hearsay. Medoff is wrong. So every word in the Medoff passage that Wikipedia quotes is false. So Eichmann and Husseini deny it and this is enough for Lewis… If we apply his standards to any ordinary criminal investigation we will be forced to let the main suspect go the minute he himself and/or his alleged accomplice deny the charges. Presto! This will save a lot of unnecessary police work. The same can be said for his curious insistence that without “independent documentary confirmation” the testimony of witnesses can be dispensed with. But, naturally, a great many things that happen in the world are not recorded in a document. Eyewitness testimony must be considered carefully, but saying that “there is no independent documentary confirmation” of a particular piece of testimony is not the same thing as producing good reasons to doubt it. And to say, in the absence of conflicting evidence, that our null hypothesis will be to consider as true the opposite of what was testified to, why that is simply absurd. The above is obvious but Lewis’s last argument—“it seems unlikely that the Nazis needed any such additional encouragement from outside”—will appeal to many as reasonable, so it deserves a more extended comment. What Lewis is saying is that the Nazis decided on total extermination for reasons that were ‘endogenous’ to their ideological program. But though killing lots of Jews as part of a campaign of terror and to make lebensraum for deserving Aryan specimens on the Eastern front was certainly part of general Nazi policy, the ‘Final Solution,’ as pointed out above, was initially and for a long time a program of mass expulsion, and did not contemplate (yet) exterminating the entire European Jewish population. Getting to that point required some ‘exogenous’ prodding (“from outside”); it was not an ideological requirement. Historian Thomas Marrus writes: “After the riots of Kristallnacht in November 1938, SS police boss Heydrich was ordered to accelerate emigration, and Jews were literally driven out of the country. The problem was, of course, that there was practically no place for them to go.” The reason there was no place for them to go is that no country would receive them. As historian James Carroll points out: “The same leaders, notably Neville Chamberlain and Franklin D. Roosevelt, who had denounced the anti-Jewish violence of the Nazis declined to receive Jews as refugees. …Crucial to its building to a point of no return was Hitler’s discovery (late) of the political indifference of the democracies to the fate of the Jews…” Though one may argue that this was not really “indifference” on the part of Roosevelt et al. but a very special interest (in their doom). The main point here is that, as historian Gunnar Paulsson points out: “Expulsion had initially been the general policy of the Nazis towards the Jews, and had been abandoned largely for practical, not ideological, reasons” (my emphasis). The Nazis were right bastards. No disagreement. But they did need some encouragement to go that far. 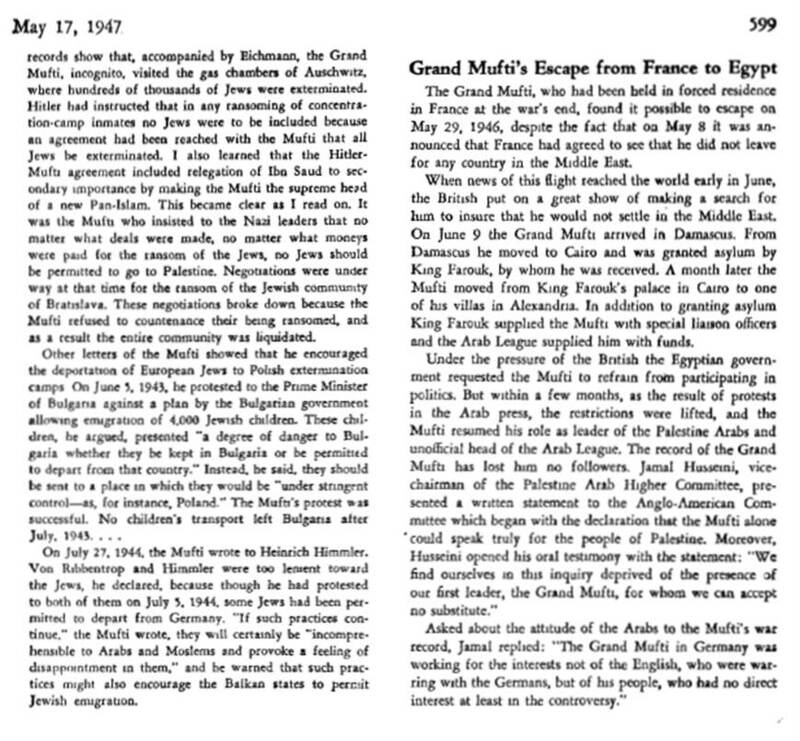 They needed to be told, first, that they would not get rid of any Jews by pushing them out to the ‘Free World.’ And then they needed to be told, by British creation Hajj Amin al Husseini, that neither could they push them out to ‘Palestine.’ Bernard Lewis is wrong. Perhaps Wikipedia would like to try again with a new set of ‘supporting’ sources? We will be waiting to examine them. The Steiner testimony—plus corroboration from Wisliceny—was presented again at the trial of Adolf Eichmann in 1961. The transcription of the trial may be read online. The Steiner testimony appears in Session #50, part 7. State Attorney Bach: May I add, in addition to the point that His Honour, Judge Halevi, made, also important is the fact that from the document we see that Wisliceny does not just accept anything that is submitted to him because he might think that it is perhaps convenient for those who tender a document to him; he does not accept everything; and when he has reservations about a certain detail, he says that that detail is not accurate. SOURCE: Transcript of the Eichmann Trial, Session 50, Part 6.